— The Antikythera mechanism is the most technologically sophisticated artifact that survives from antiquity. Currently dated to 150—100 B.C.E., it has also been described as the world’s oldest known analog computer. A shoebox-sized assemblage of 37 interlocking gears and dials, the Antikythera mechanism is an astronomical calculator complex and precise enough to predict eclipses and track the positions of the Sun, Moon, Mercury, Venus, Mars, Jupiter and Saturn down to the hour, even compensating for their elliptical orbits—contradicting the prevailing Greek philosophical belief of its time that all orbits were perfect circles. Today some researchers believe that though Greek, the Antikythera mechanism actually embodies Babylonian not ancient Greek astronomy, pushing its origins even further into antiquity as well as geographically eastward. Finally, though thought to be rare if not unique, many researchers say that its refined design and manufacturing suggests that it had a number of undiscovered predecessors and perhaps was even the product of an as-of-yet unknown guild. 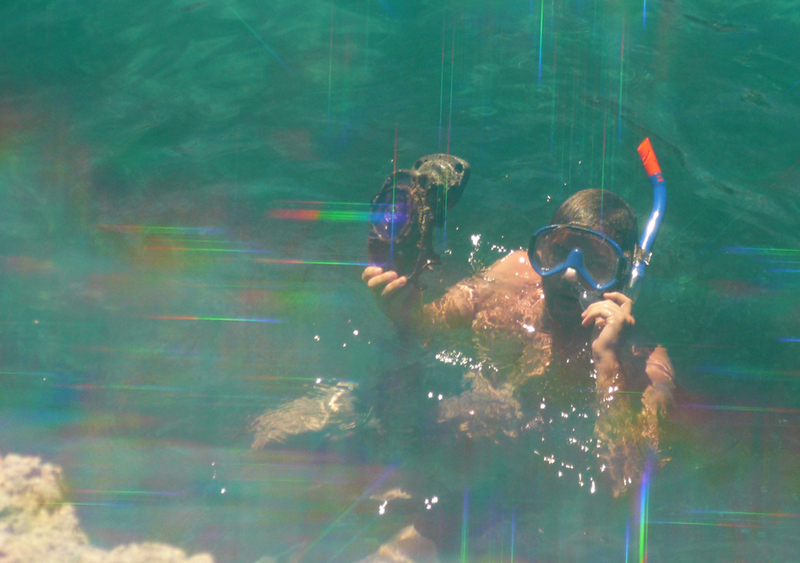 This is a photo of me taken through a double-axis diffraction grating film off the coast of Kythera, the island just north of Antikythera. It documents here more of a ‘parachronism’, something along side of or adjacent to something else in time and place. (*) The notion that the Antikythera mechanism is anachronistic (from the Greek ana: against and chronos: time), reveals more our expectations and ignorance of history rather than anything about the actual material circumstances of the device. Declaring artifacts anachronistic springs from, as well as reinforces, the commonsense perspective of history as a uniform and continual unfolding of a primitive past into our uniquely technologically advanced present. Mark Hagen was born in Black Swamp, Virginia in 1972. He lives and works in Los Angeles. Recent solo exhibitions include TBA, China Art Objects Galleries, Los Angeles (2010). Upcoming solo exhibitions include Galeria Marta Cervera, Madrid, Spain in September (2011), and Almine Rech, Paris in January (2012).